The difference between them is 18 months; once your album passes that point in its shelf life, you’re ‘catalogue’. The reasons behind this rule are eye-opening in their irony. Back in 1991, the industry was going through a format change; consumers were replacing their vinyl collections with CDs. As a consequence, purchasing albums for the second time became the norm – none more so than Meat Loaf’s classic Bat Out of Hell (1977). This second wave of demand caused this 14-year-old album to dominate the charts – again! Yet the purpose of charts is to promote new releases, not old, so in response the ‘catalogue rule’ was born – decreeing that only ‘new’ or ‘frontline’ albums were chart-eligible, while anything released more than 18 months ago was ineligible. The rule succeeded in removing Meat Loaf from the top of the charts – and all because the music industry was struggling to deal with a format change. Here’s the irony: 26 years later, we’re now struggling with another format change. The 18 month ‘catalogue’ rule affects more than just marketing and charts, yet in an age of streaming it is akin to trying to fit a square peg into a round hole. Frontline releases dominated in the era of sales, making up around half of a label’s annual turnover. Yet in streaming, consumers will often consume older content that they will have purchased in an earlier format. Streaming produces a monetary windfall for catalogue that transactions never did, helping catalogue make up the majority of a label’s revenues. This poses the question: should we change the rules of what defines ‘catalogue’ for streaming as opposed to sales (a possibility we explore in depth later in this article)? Sadly, there is no quick fix. Converting the future into the past does not move us forward. For a parable, think about the ‘Stream Equivalent Albums’ metric, which rolls up streaming (the future) into an album unit (the past) at some predetermined ratio. Whilst allowing us to conceptualise demand using established metrics, you can appreciate those who ridicule this rule as being similar to referring to ‘fax equivalent emails’. 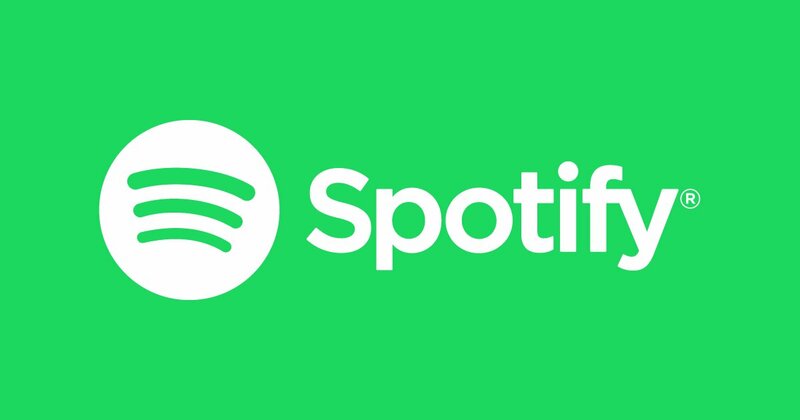 To calculate this paradigm shift, Spotify has just analysed all tracks released during April 2015 – crunching the numbers on almost three-quarters of a million songs released in that single month. Here’s what we learned: 40% of those tracks had more streams between April 2016 through March 2017 than they had from April 2015 through March 2016. Put bluntly, year two earned more than year one. This merits a pause for thought. How do mindsets (as well as rules) have to change to accommodate what is clearly more than ‘just another’ format change? In an age of sales, the industry might be tempted to take its foot ‘off the gas’ after an album has been out for a couple of months and the initial sugar-high has faded. But in 2017 it may actually be necessary to put your foot ‘on the gas’ a year after the initial release. 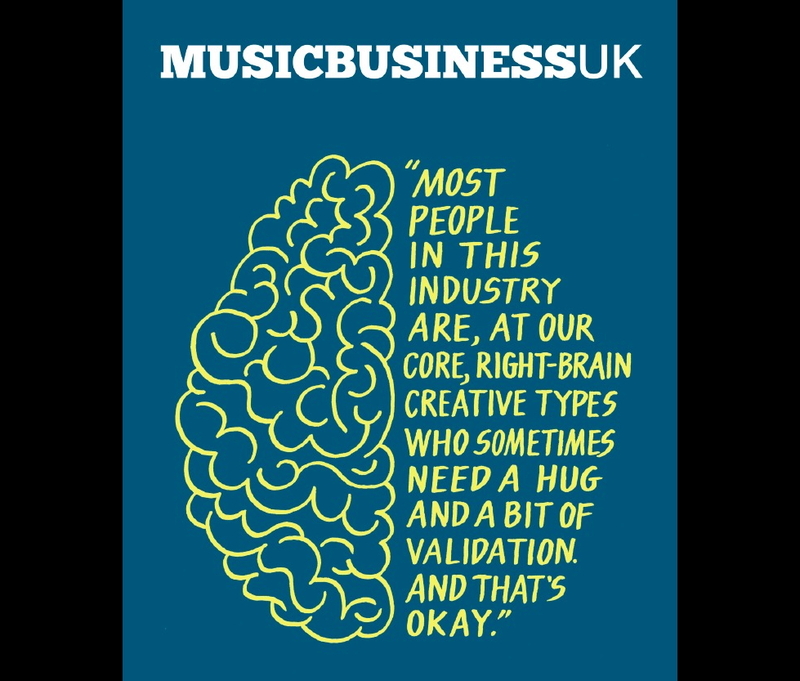 The industry needs a metanoia of the musical mind, and a case study in best practice can help us get there. For best practice in adapting to this new world, look no further than the story of Las Vegas band Imagine Dragons (pictured, main), who are signed to KIDinaKORNER/Interscope. Billboard labelled them as the breakthrough band of 2013, following the group’s debut LP release of Night Visions in September 2012. The US industry magazine observed of their success that “this is what momentum looks like”. These calendar dates matter, as it was during this highly disruptive period that the US industry started to transition from sales to streaming en masse. The example of Imagine Dragons allows us to join the dots, and show why a front-loaded sales mindset can miss opportunities as back-ended streams create them. To highlight this point, check out the chart below. 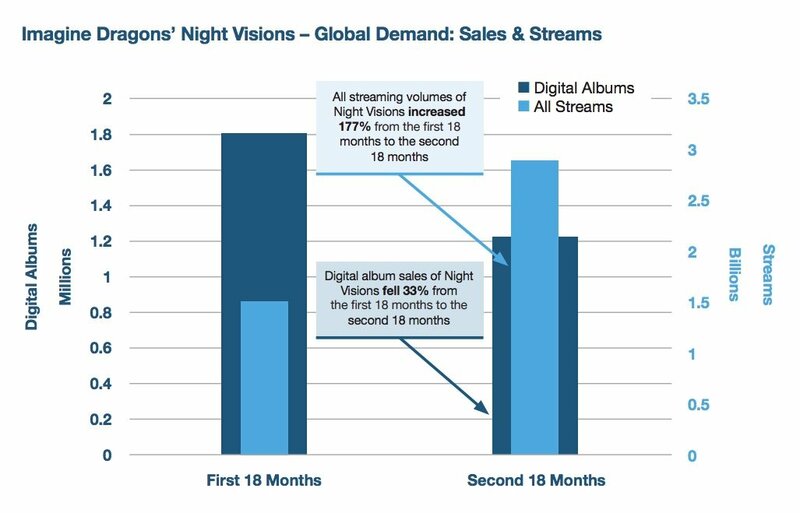 We examined all digital album sales and all streams during months 1 to 18 following Night Visions’ release – and then did the same for months 19 to 36 (on the right). We factored in the effect of drip-feeding singles prior to the album release. What you can see is that sales taper off by 33% in the second period compared to the first, whereas streams grew by a massive 177% from the first period to the second. This is what streaming momentum looks like. In fact, Spotify has seen Imagine Dragons’ catalogue maintain momentum throughout their three album releases: Night Visions, Smoke + Mirrors and, most strikingly, Evolve – which has remarkably taken Interscope’s hard fought success, and doubled it. Measuring momentum over time isn’t easy, not least because streaming itself is growing in both subscribers and volumes. Treating this growth through normalisation isn’t straightforward, as simply dividing the success of a band’s streams by its share of total streams or listeners is fraught with caveats. A more important dynamic to manage in momentum is attention – demand has to swim against this tide of thousands of albums being released each month, putting downward pressure on the attention in those released the month prior. And “engaged” they have increasingly become. By taking a long view, Imagine Dragons have reached new peaks that surprised us all, even in the inner circle here at Spotify. As of October, Imagine Dragons are now the 14th most successful artist in the history of Spotify, and have just passed 5bn streams. Just as well, then, that the label didn’t take their ‘foot off the gas’ 18 months after their debut release. What happens when your fans preferred your earlier stuff? The chart below helps us conceptualise what the format change is doing to the antiquated 18-month definition of ‘frontline’ and ‘catalogue’. Before you ask, it is anonymised data based on a single US major label’s commercial performance across a three-year period. It shows very clearly what would happen when you move the industry definition of ‘catalogue’ away from its current meaning – ie. music that is over 18 months old. As you follow the dark blue line of sales from left to right on our sliding scale, you can see that, if we define ‘frontline’ as anything up to 18 months post-release, then it makes up 47% of this record label’s sales value during the period. 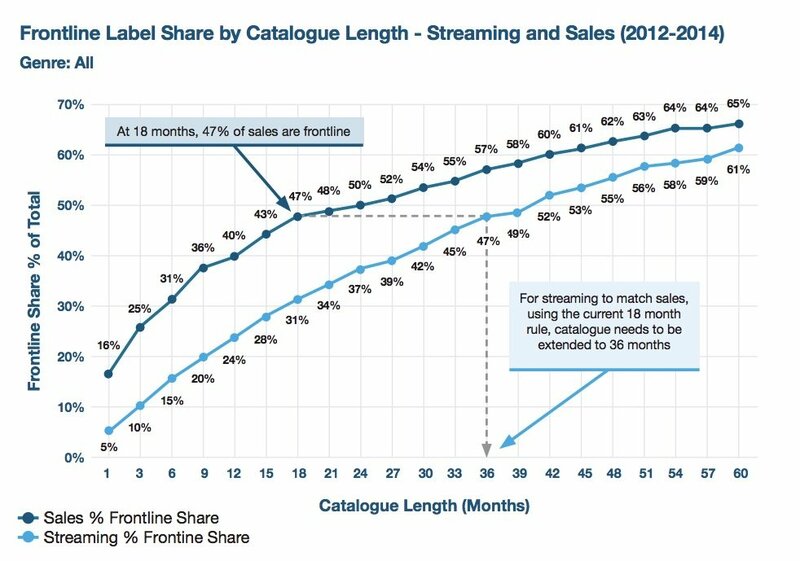 But follow the light blue line to the same 18 month point: ‘frontline’ under this definition only represents 31% of this label’s total streaming demand. So now let’s ask ‘what if?’; that is to say, what if you wanted to change the age-old 18 month ‘catalogue’ rule so that the make-up of streaming resembled sales? One quick fix is illustrated in the chart, which is to convert the future into the past; that is, to extend the definition of frontline on streams out to the point where it mirrors the share of demand on sales. As shown below, this would mean extending the definition duration of streaming ‘frontline’ out to 36 months. This all leaves the global record business with a crucial question to answer: what changes when year two of an artist’s campaign actually earns you more than year one? 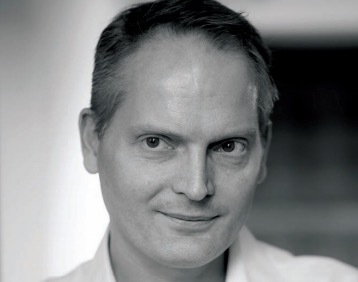 Will Page is Spotify’s Director Of Economics. The above research was put together with his team, including Gary Eggleton, Senior Economist at Spotify, and David Erlandsson, Data Scientist at Spotify.